The global economic crisis has increased the pressure on Trade Promotion Organizations, TPOs, to demonstrate the value they deliver in driving economic development and growth. The challenge all TPOs face is recording and reporting the impact their services have in beneficiary companies. Mr. Teixeira benefits from being concurrently the president of one of the most dynamic networks of trade promotion organisations, and the global network of investment promotion agencies. From this vantage point, he will provide a view of the challenges faced in trade and investment promotion in the current global environment. Mr. Volpe is publishing a new book on the effectiveness of TPO services in Latin America, based on surveys applied to companies having benefitted from those services, among other tools. He will elaborate further on the significance of these results for the work of TPOs and their services in the current environment. Prof. UMAÑA , who participates in a leading research group on competitiveness and sustainable development in INCAE, will discuss the challenges in terms of enterprise competitiveness prevalent in the region and the requirements these impose on the work of trade promotion organizations. Discussion on the services TPOs should focus on to ensure they develop SME export readiness in the current environment. Identifying the right mechanisms to take the services to the right users is a relevant question for every service TPOs produce. Three TPOs share their practices and mechanisms in this process. 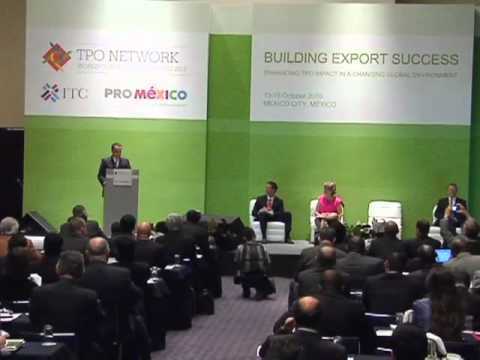 The countries wishing to host the next TPO Network World Conference and Awards, to take place in 2012, will present their bid. The winners of the 2010 TPO Network Awards are announced and the awards are delivered during a gala dinner. What mechanisms do TPOs currently use to follow up and monitor their service delivery and client reaction? Selected TPOs share their experiences and practices. The key concern of TPOs is to ensure that their services do have an effective impact not only on their target clients but ultimately on boosting exports. Selected TPOs will share their practices and experiences in measuring the impact of their services. Brief discussion of the experience in the development, operation, benefits and difficulties of regional networks of TPOs and lessons to be learnt. Summary of the discussions and the main conclusions. Recommendations for follow up to the next activities of the TPO Network.